AUSTRALIAN doctor Richard Harris is being credited with a genius medical move that helped saved a Thai soccer team trapped in a cave. 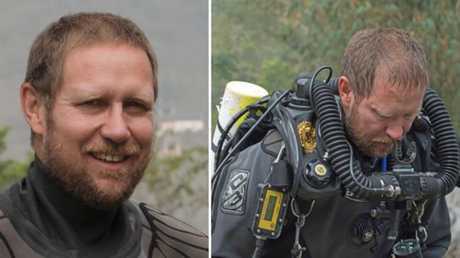 Dr Harris, an expert diver from Adelaide, was on a ledge deep within the cave administering a mild sedative to each of the boys as they were rescued, ensuring they would not panic during the swim. It comes as Dr Harris' dive partner, Dr Craig Challen, has been revealed as the second Australian involved in the rescue mission. The vet, from West Australia, is one of Australia's leading technical cave divers. He has been diving for more than 20 years. Meantime, Julie Bishop has praised the "extraordinary efforts" of 20 Australians directly involved in the remarkable rescue of the 12 boys and their soccer coach. "It is a remarkable outcome, the end of an extraordinary ordeal," she told Channel Seven's Sunrise program this morning. 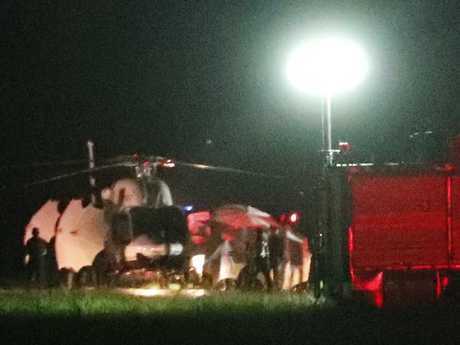 The Foreign Affairs Minister confirmed all rescue workers involved in the dangerous rescue mission, including the Australians, were safe and well after she contacted Australia's Embassy in Bangkok overnight. She paid tribute to all involved in the operation and particularly Thai Navy SEAL Saman Kunan, who tragically lost his life in the effort to free the boys. "We do of course recall that one volunteer did die in the course of this incredible process of extracting the boys from the cave, and we feel for his family," she said. "But there has now been this quite remarkable outcome. The ordeal is over." Ms Bishop particularly highlighted the efforts of Australian doctor Richard 'Harry' Harris, whose involvement in the rescue mission had been requested "at the highest level within the Thai government". The 53-year-old anesthetist and cave diving expert from Adelaide played a pivotal role in the rescue, including administering a small sedative to the boys before they exited the cave so they would remain calm on the 1.7km swim to the surface. He entered the cave before each rescue operation with a Thai medical team and assessed the boys' fitness to make the journey. "He is an extraordinary Australian and he certainly has made a big difference to the rescue effort here in Thailand in this instance," Ms Bishop told Sunrise. "I am hoping to speak to the Thai Foreign Minister Don Pramudwinai later this morning and I'm sure that he will confirm that Dr Harris was identified by the British diving team and then was requested to be involved at the highest levels within the Thai government." She added that Dr Harris was "very well known" to the Department of Foreign Affairs and Trade because he had been one of the doctors involved in medical assistance teams working on natural disasters throughout the Pacific. Ms Bishop also revealed Dr Harris was assisted by his dive partner, Dr Craig Challen, a vet and cave diving expert from Perth. Dr Challen, the second Australian involved in the rescue mission to be named, is one of Australia's leading technical cave divers. He has been diving for more than 20 years. "Between them and the rest of the Australian team, I believe we were an integral part in the overall rescue," Ms Bishop said. In a statement this morning, Ms Bishop also praised Thai authorities for outstanding leadership throughout the rescue operation. "The rescue mission was made possible by a remarkable example of international cooperation," she said. She said the dangers of the mission were underscored by the tragic death of the former Petty Officer 1st Class Kunan. "The Australian Government sends its condolences to his family," she said. All 13 members of the Wild Boar soccer team finally made it to safety in one of the most inspiring rescue missions the world has witnessed atfer an 18-day ordeal. "We did something nobody thought possible. 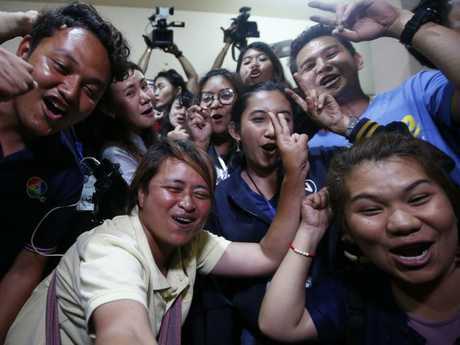 Today, Thai people, team Thailand, achieved mission impossible," rescue chief, Governor Narongsak Osotthanakorn said to applause and cheers, hours after the team - who were soon followed by Australian anaesthetist Richard Harris and four Thai Navy SEALs - emerged securely. "We are delighted. We have done things we never thought we could do. I'm proud we could complete the mission impossible." "We are not sure if this is a miracle, a science, or what. All the thirteen Wild Boars are now out of the cave," the Thai Navy SEALs wrote on their Facebook page. "Everyone is safe." "I'm happy for Thais all over the country," said Payap Maiming, who helped provide food and necessities to rescue workers. "And actually just everyone in the world because every news channel has presented this story and this is what we have been waiting for." "It's really a miracle," Payap said. "It's hope and faith that has brought us this success." Amporn Sriwichai, an aunt of rescued coach Ekkapol Chantawong, was ecstatic. "If I see him, I just want to hug him and tell him that I missed him very much," she said. Prime Minister Prayut Chan-o-cha earlier confirmed that the boys had been given calming medicine "so the children won't panic, just like we take anti-allergy so we feel OK and are not excited". 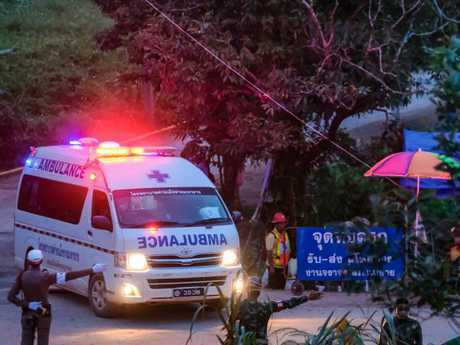 Two of the eight boys who came out over Sunday and Monday were diagnosed with mild pneumonia at Chang Rai hospital, 60km south of the Tham Luang cave system. The governor said they had been treated with intravenous drips and were responding well. "We expected them all to have pneumonia, and came up with preventive measures, but most of them haven't got pneumonia," he said. 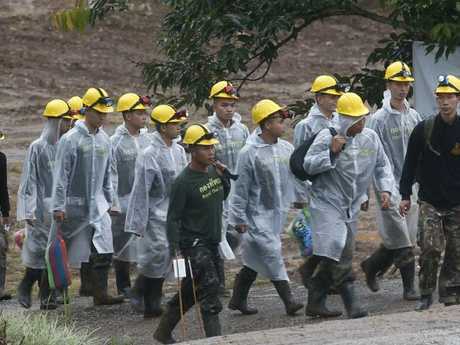 The 12 boys and their coach had been trapped in the cave since June 23. 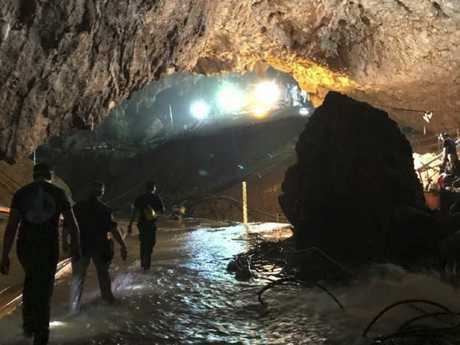 Governor Osotthanakorn said the last day of the operation had moved even faster than the previous two days, with evacuation times sharply cut as the core diving team became better familiarised with the dangerous route. They left the strongest team members till last, including coach Ekkapon Chantawongse. What was days ago a five-hour journey in blackness, through high-water chambers and a risky choke-point tunnel, was cut down to only three hours. 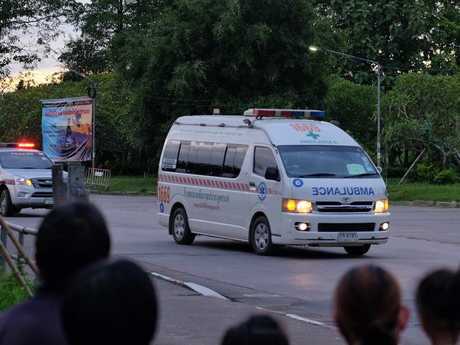 Ambulances transport some of the boys rescued from Tham Luang Nang Non cave from a helipad to hospital. It is understood that the boys were rested and given initial medical attention for several hours at Chamber 3, where the rescuers set up their underground staging camp, before being assisted out of the cave. Mr Narongsak said that although there had been heavy overnight rain, water levels were holding stable, meaning they were able to speed up the operation of positioning oxygen tanks along the route, and re-tensioning the safety line. "The team completed their set-up for the mission faster than expected and it got underway at 10am (1pm AEST)," he said. 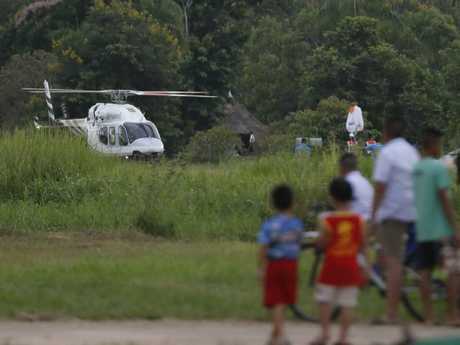 A helicopter believed to be carrying one of the boys rescued from the flooded cave lands in Chiang Rai. The rescued boys have been treated for passing fevers, coughing, light wounds and general weakness, with medical experts satisfied the boys have made it through their ordeal largely unscathed. 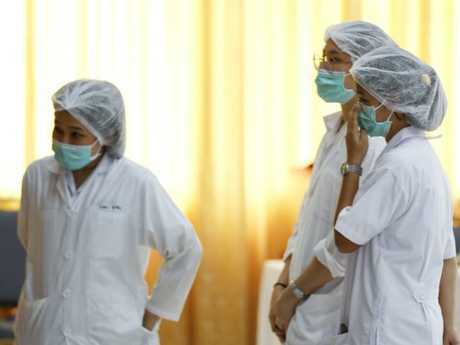 Families have been able to speak to the quarantined boys behind a glass partition at Chiang Rai hospital, where they will remain for up to seven days until they are given the complete all-clear. "Because the kids are still young, they are very resilient. They can talk normally, everybody is joyful and very glad to come out," said Dr Jedsada Chokdamrongsuk from the Public Health Ministry. The expert said the boys had suffered from exposure to water and cold over their long stay underground, but were in surprisingly good condition. "They're hungry a lot and want to eat a variety of food, but at this stage we're given food that is easily digested and bland. They can sit up and eat, but there are no worrying conditions. "They asked for bread with chocolate, which we think is OK."
The boys have told the rescuers that there were no animals such as bats in the cave so the medical experts feel certain there is no biological cross-contamination. "We have to wait for microbiological results from the lab," said Dr Jedsada. "They're immune systems are weakened so it's best they stay in hospital." The doctor said the boys will be able to watch the World Cup in quarantine - but as to news about their rescue, the psychologists don't want them to watch any coverage until the team was fully reunited in hospital. The governor paid tribute to Saman Kunan, the former Thai Navy SEAL who died in the rescue. He called him "a real hero". World leaders and sports stars joined the global outpouring of relief and congratulations at the incredible rescue of the boys. US President Donald Trump was among the first to congratulate the Thai Navy SEALs who spearheaded the mammoth international rescue effort at the Tham Luang cave complex in northern Thailand. "On behalf of the United States, congratulations to the Thai Navy SEALs and all on the successful rescue of the 12 boys and their coach from the treacherous cave in Thailand," Mr Trump tweeted. "Such a beautiful moment - all freed, great job!" "Delighted to see the successful rescue of those trapped in the caves in Thailand. The world was watching and will be saluting the bravery of all those involved," added British Prime Minister Theresa May on Twitter. What wonderful news from #Thailand! So much to admire: the perseverance of the brave boys and their coach, the skill and determination of the rescuers," tweeted Steffen Seibert, German chancellor Angela Merkel's spokesman. Belgian Foreign Minister Didier Reynders said he was "Relieved with the happy outcome" of the cave rescue. Tech guru Elon Musk, who visited the cave and offered the use of a prototype minisub made from rocket parts, said: "Great news that they made it out safely. Congratulations to an outstanding rescue team!" In the end, the sub was not needed and Musk earlier said he would leave it "here in case it may be useful in the future". "Youjuuuu!," exclaimed Chilean miner Mario Sepulveda, who was among 33 miners trapped down a mine for 69 days in 2010. "I feel a lot a lot of emotion. What can I say? I hope these kids will be very successful," he told AFP. It comes as a host of soccer stars added their congratulations to the global jubilation. Football's governing body FIFA, who had invited the boys to the World Cup final on Sunday, also welcomed the rescue but said the boys were too weak to attend the game in Moscow. FIFA boss Gianni Infantino had invited the boys' Wild Boars soccer team to the final "as our guests" last week. Manchester United also invited the Wild Boars, as well as those involved in the rescue, to travel to England and visit the club. Audiences around the world have cheered the rescue of 12 boys and their soccer coach from a cave in Thailand with messages of support as the saga generated suggestions of help, prayers and - finally - expressions of relief. 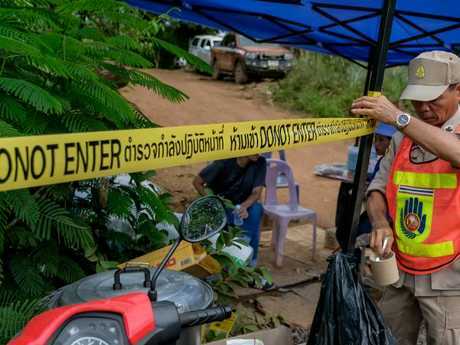 People turned to television, news sites and social media to keep up with the fate of the Wild Boar soccer team that went missing while exploring the cave in Chiang Rai in northern Thailand on June 23. A Google search on Tuesday for the words "Thai cave rescue" revealed 359,000,000 results, with interest peaking since last week when British divers found the boys and the rescue mission began. "Miracles may happen every day but this is one for the ages," said Cornell Brooks, chief executive of the NAACP civil rights group in the United States. With international journalists stationed outside the cave, television stations have carried updates and the story has ranked highly in terms of the most read or viewed items on sites such as Britain's BBC and NBC News. On social media, live Facebook videos from the reporters and volunteers on the ground have been popular. On Twitter and Instagram, wellwishers sent messages of support, advice and sketches of the boys in the cave using hashtags such as #Thaicaverescue #boarteam #Thainavyseals #PrayForThaiBoys and #Bringtheboarteambackhome. A Thai navy SEAL Facebook post confirming all 13 had been rescued on Tuesday had more than 200,000 likes and around 56,000 shares in the space of an hour, sparking comments such as: "You are ALL HEROES! Thank you on behalf of a grateful world!" and "On behalf of all mothers I thank you". On Twitter there were 160,000 tweets containing "All 12". Students fixated on the gripping rescue mission refrained from playing soccer while the rescue mission was under way. 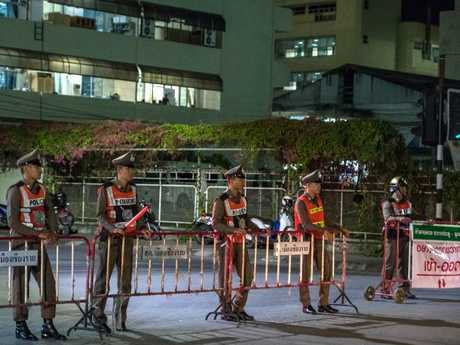 The Bangkok Post reported emotional students have not been down to the Mae Sai Football Club, instead praying for the safe return of their classmates. Fourteen-year-old Puwadech "Bank" Kumngoen and Kittichoke "Tong" Konkaew said no one had felt like practising since the 12 boys vanished, according to the Bangkok Post. "Of course I want to play. I want to race down the pitch as soon as I can," Pwadech told the Bangkok Post. "This is World Cup time and I've been studying my favourite players to learn their techniques. "But I'm going to wait because I want to try those tricks on a real pitch with my friends." Kittichoke said he hoped to watch the World Cup final with the 12 boys, and that waiting for updates during their time trapped in the Tham Luang cave had been a draining experience. 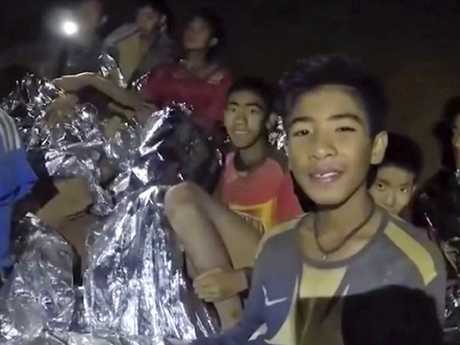 Puwadech said he was ecstatic when he heard the first four boys were alive and well after being rescued from the waterlogged cave. "I ran down from upstairs and jumped when the operation commander announced on TV that four of my friends had made it out safely. My whole family was so happy and we believe everyone will be okay," Puwadech told the Bangkok Post. On Monday, Foreign Affairs Minister Julie Bishop spoke about the "critical" role Australians had played in the rescue. She said Adelaide doctor Richard "Harry" Harris was crucial in determining whether the boys and their soccer coach were fit to make the 1.7km dive to the surface. She spoke of the "19 Australian personnel directly involved" in the "high risk" operation. 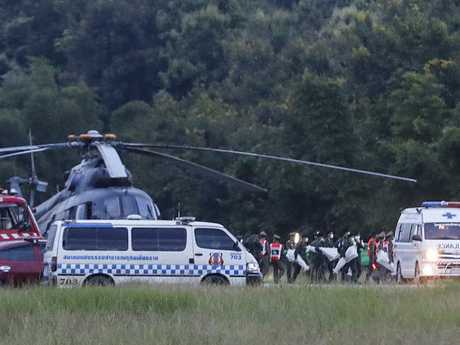 Ms Bishop highlighted that Thai Prime Minister Prayut Chan-o-cha had visited the site and specifically thanked the Australian personnel involved in the rescue. "He expressed the deep appreciation of the Thai people for the work that the Australian team had undertaken," she said. "We wish all of the rescue teams the very best and our thoughts are with the boys, their parents and families and the rescue teams that are working tirelessly to achieve what will be a remarkable outcome if all of the boys are able to be rescued from the cave safely." This photo tweeted by billionaire Elon Musk, who contributed to the rescue effort, shows the inside of the flooded cave.